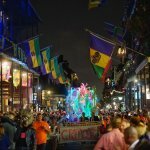 All you need to know from a Jazz Fest pro. Every day of the last weekend in April and the first weekend in May for most of the past twenty years, I’ve thrown a hat on my head, put a wide grin on my face, and biked towards the Fair Grounds. 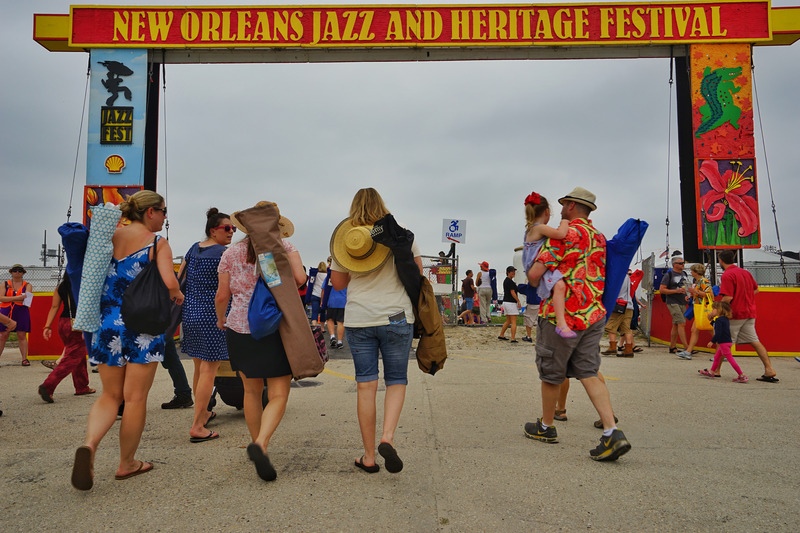 After hundreds of sunburns, missing some amazing music because I walked the wrong way, and one or two (or five) times failing to remember the importance of hydration – I’ve learned some lessons about how to make the most of Jazz Fest. So, gather ’round, y’all. I’m here to share ’em with ya. First things first: Get on the Jazz Fest website and figure out what you’re seeing, and when. 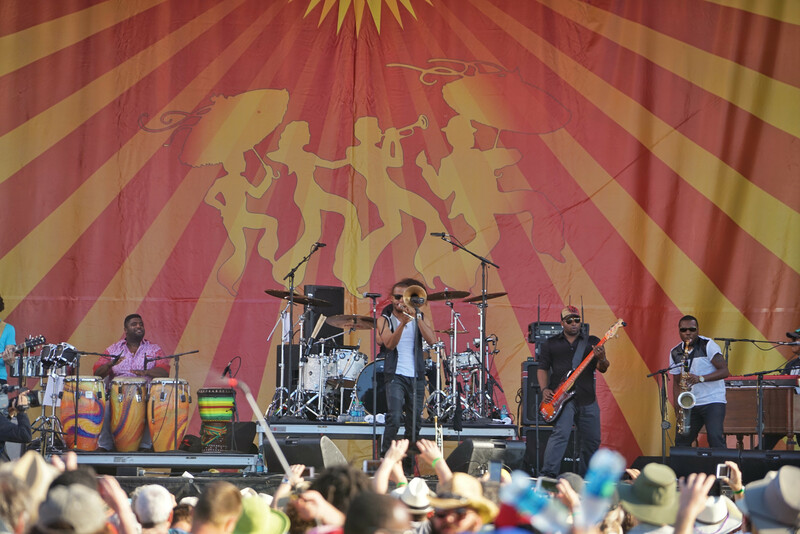 You’ve heard of – and heard – the big-name acts at the Acura, Congo Square, and Gentilly stages. But before you nail down your plans, find out who’s on small stages like the Native American Village and Alison Miner Heritage stages. Don’t sleep on the “heritage” aspect of the festival, either. 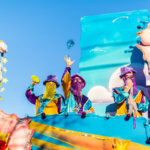 The Jazz and Heritage Stage is a mecca for local brass bands, Mardi Gras Indians, and funk, while the Fais Do-Do Stage features Cajun and Creole music all day, every day. The festival website and app have tons of info on all the acts. 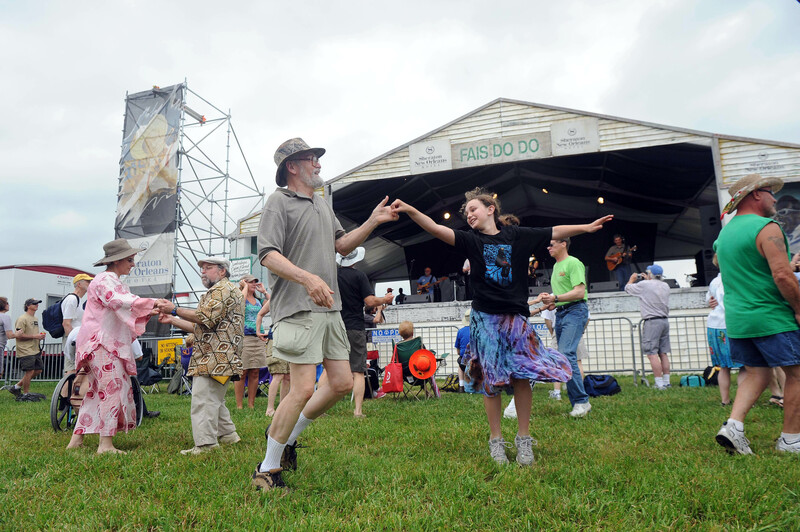 Jazz Fest has almost as many food options as it has music options, so you won’t go hungry. And while dishes like Crawfish Monica are crowd favorites, you may find yourself wishing for a shorter line, a healthier option, or even just a lesser-known treat that wasn’t on your radar. Bennachin Restaurant: Their jama jama dish featuring spinach, chicken on a stick, and fried plantains is a must. Straight-up jama jama (that’s the spinach) is awesome, too. The booth is way in the back behind the Congo Square field. Try the hot sauce. Jamila’s: This Mediterranean Riverbend staple often has short lines. It offers has a satisfyingly light salad and a great bisque. The booth is along the main strip of food booths running along the inner track between the Acura and Congo Square stages. Fried oyster spinach salad: Well, OK, it’s not exactly healthy food, but it’s delicious and involves veggies. If you’re facing the Jazz and Heritage stage, head left. It’s one of the first food booths you’ll hit. Vietnamese food: Delicious and healthy, find it by the Jazz Tent. Shrimp maque-choux in the Native American Village: There’s rarely a line, it’s light and yummy, and it represents a key connection between our cuisine and the indigenous people of the region. Stuffed mushrooms from Prejean’s: For reasons I will never understand, this booth line is often short and it’s one of the best seafood treats out there. If you find yourself in need of a near-meal between the Jazz and Blues Tents, Li’l Dizzy’s Trout Baquet with crabmeat is where it’s at. Unless, of course, you don’t like butter. In which case, you may be at the wrong festival. Bonus: Most vendors will give you tin foil if you want to stock up and take something delicious home with you. It’s a better plan than pretending you’re gonna make that fancy dinner reservation after leaving the Fest. I highly recommend starting your day with a large rose-mint iced tea, ordered sweet or unsweet. Our sun is for real, y’all. Chances are your inclination for imbibing the night before was for real too. As you navigate towards sugar territory, the fresh-squeezed lemonade, strawberry or otherwise, is another tasty, booze-free option. Red wine is usually served cold like the white wine and champagne to keep it from turning. Bloody Mary is also an option if beer, wine, margaritas, and daiquiris aren’t your thing. Remember, the folks serving beverages are working hard in the sun all day. Tips are good for the old karma boomerang. Cabs, Lyfts, and Ubers: United Cab (504-522-9771) has an Uber-like app you can use for your way there. 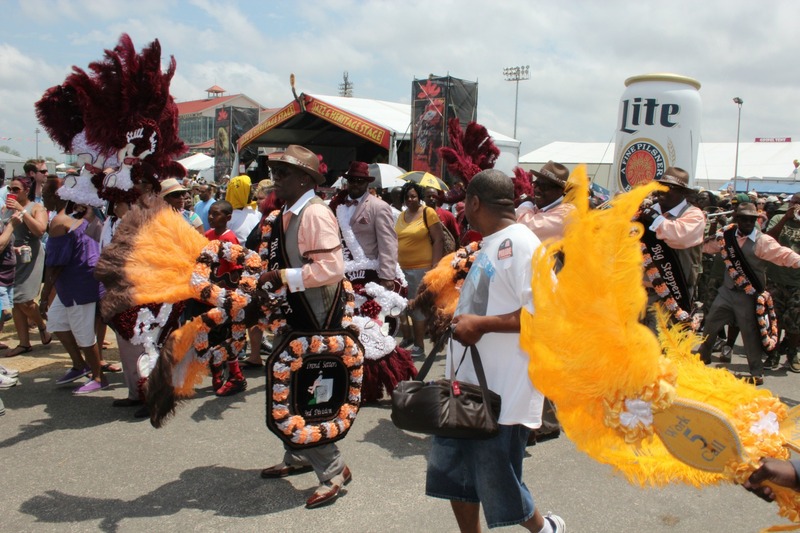 To cab back, just head to the taxi stand on Esplanade Avenue just outside the Fest. Buses conveniently pick up from a block away if you don’t have luck with a cab. 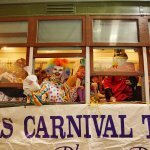 Driving: When looking for parking, bear in mind you can always go around to the lakeside or Gentilly side of the Fair Grounds. Plan some extra car time in both directions, though, and remember you will be sharing the road with cyclists, pedestrians, and police sobriety checkpoints. Use the outside track on days like the second Saturday, which is always notoriously crowded. 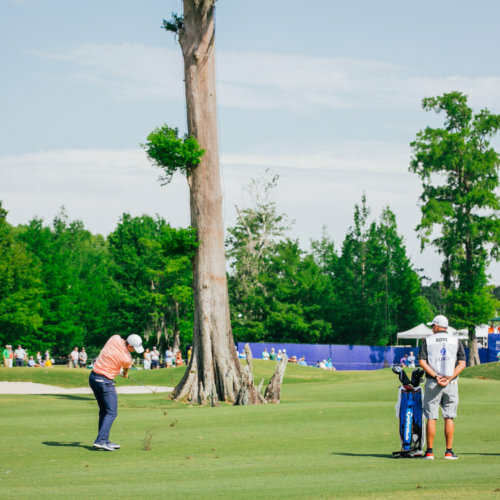 That said, on days when there are huge acts at Acura, Congo Square and Gentilly stages simultaneously, don’t be afraid to cut through the grass. 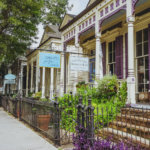 Your best bet for breakin’ on through to the other side is often to veer from Acura past the food booths and towards the statues of New Orleans music community legends behind the Congo Square crowd. There’s usually a cozy spot with decent sound in the grass back there if you’re feeling whatever’s playing at Congo Square. To get from Jazz, Blues, Economy Hall, or Gospel to Gentilly, go with the track. 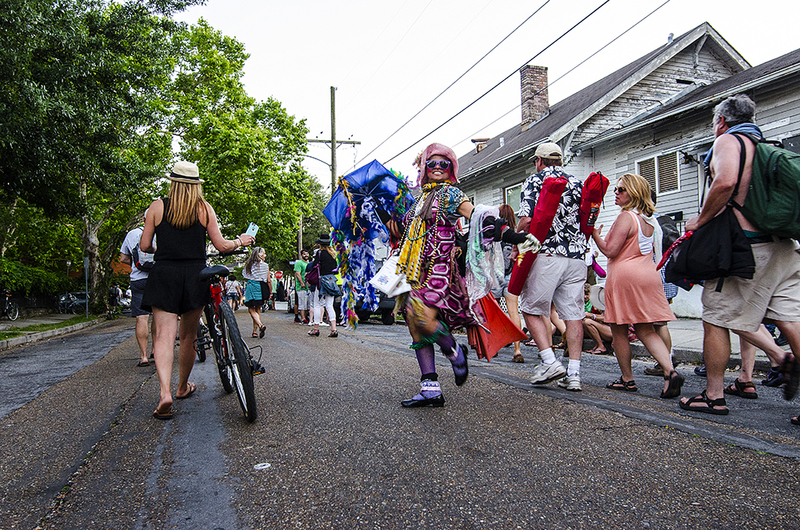 Bear right, and you won’t get caught in the human traffic jam that often materializes in front of the Big Chief passholders’ Grand Stand at the Gentilly Stage. You know that smell you keep noticing? Especially when it rains? You’re on a horse racetrack. Guess why the mud smells that way and proceed accordingly. When rain is in the forecast, boots (and socks!) are preferred over flip-flops. Maybe rethink those flip-flops no matter what the weather. If you are a sitter at Jazz Fest, blankets are a great option that won’t bonk the faces of folks behind you as you move from stage to stage. The Interwebs sell lots of water-resistant outdoor blankets that fold up and can be a nice alternative to metal fold-up chairs. The bathrooms with A/C generally have crazy long lines, but sometimes that’s your only option. They’re located in the Grand Stand (the ones upstairs on the Esplanade Avenue end of the building tend to have shorter lines than the ones downstairs) and on the track between the Blues and Jazz Tents. Bringing your own TP and hand sanitizer is never a bad idea for the rest of the day, when you’re bound to use a regular ol’ port-o-let. I can’t tell you much about this sacred, secret ritual in the interest of honoring the tradition’s clandestine power. I can tell you that it’s weird and lovely, like New Orleans herself, and that it involves a watermelon. If you’re near Fais Do-Do in the afternoon on the Thursday of Jazz Fest, keep your ear ready for a chant that starts with “Watermelon, watermelon,” and ends with, “Sell it to the rich, sell it to the poor, sell it to tha lady standin’ in that do-o-o-or.” You can work out the rest. I believe in you. Happy Festing, y’all!